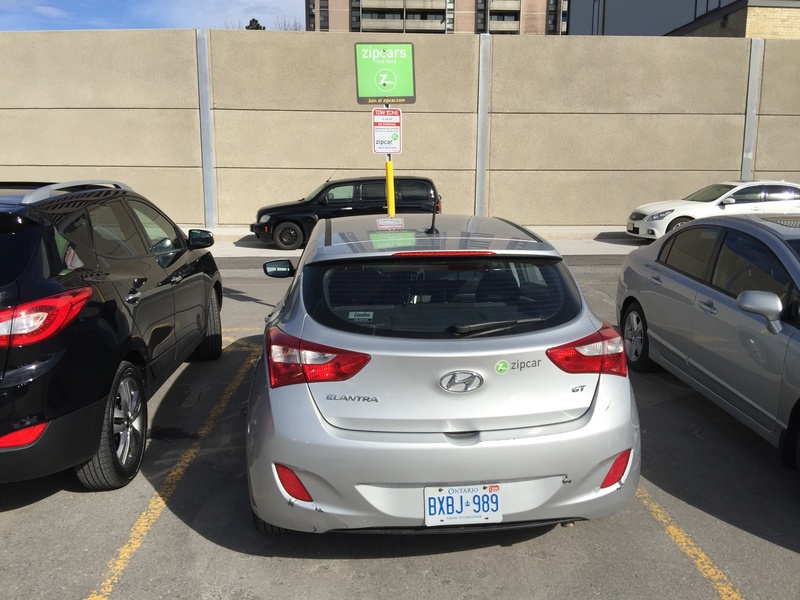 Did you know that Weston has its own (yes, just one) Zipcar. The company has an interesting business model; you can rent a Zipcar for terms as short as an hour or as long as several days. Another difference from a standard car rental is that the company pays for the gas; if the fuel gauge slips below ¼ full, customers are required to fill up the car using a pre-paid card in the vehicle. As you might expect, most of the company’s vehicles are concentrated in the downtown core and Weston’s is one of the most northerly. To use one of the company’s fleet, there is a one-time application charge of $30 and an annual fee of $35 but if you only need a car occasionally it’s cheaper than paying registration and insurance on a car that is parked for most of the day. What kind of car do you get for around ten bucks an hour? Well, Weston’s car is a Hyundai Elantra. Where you may ask is Weston’s Zipcar? Its outside the UP Express station (unless someone is using it) in its own permanent parking spot. Weston’s Zipcar parked in the UP Express lot. 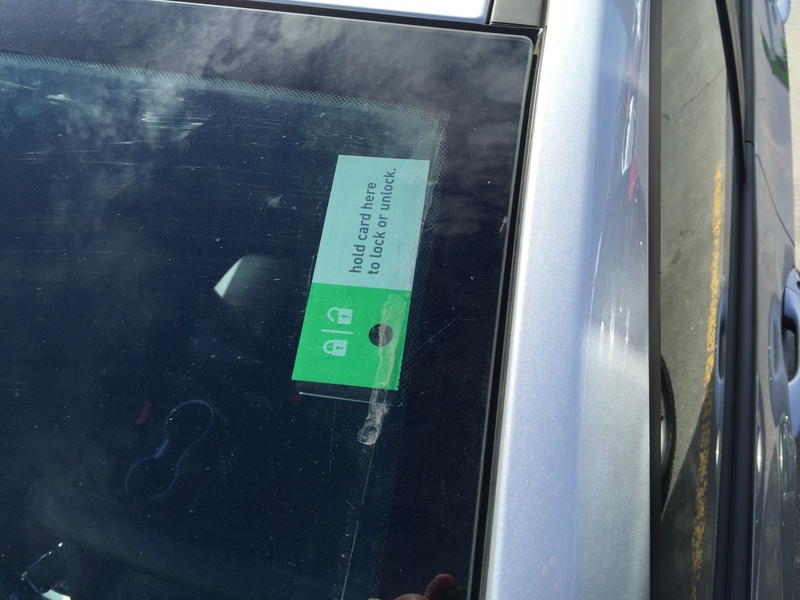 To get inside the Zipcar you hold your member card to the windshield here. Would you use a Zipcar? Have you used one? Let us know. By the way, I photographed the Zipcar at around 5pm. on Friday. The UP Express from downtown was just pulling in. A lot of people were getting off; dozens actually and the train was still quite crowded as it left for the Airport. Obviously many people are now finding the train to be cost (and time) effective. Had a great first day using car from lot at Scarlett and Eglinton area. When we returned car, someone had illegally parked there. Followed procedures and called customer service who were really no help – they gave ideas like talk to landlord, park on street (couldn’t) – basically no Plan B for the customer. So they said park somewhere safe, even if it’s far away and take TTC home (err. thx) and we did and told them where it was and they said ‘super thank you’. Next day the office from Toronto pretty much threatened me with paying for Tow Truck fees and worse – they thought I’d stolen the car. Did they bother to check with their American customer service line? Nope. No communication. Anyway, it goes on and on for days and we eventually left the company (after paying to have it returned to it’s original spot). Aside from the terrible ending, the rest was good. Convenient yes, but good luck if you run into trouble.